The table of six at Ojo Verde Inn began to eat their food and those facing Paseo de Norte looked out of the window next to the street and saw eighteen wheelers carrying logs from fresh cuts in the Carson National Forest. Snow had frozen to the bark of the fresh cut logs…. Those at the table that faced away from the street glanced upward at vigas in the ceiling and at artwork for sale on the wall. The prices for artwork of local Ojo Verde artists were priced to sell and the Pinion-Buttermilk Pancake woman eyed the brilliantly-hued painting of the Tulona Pueblo…. “I will buy that painting and make a place for it in my living room,” the Pinon-Buttermilk Pancake woman said to herself. When brunch was over, she went to the front desk of the Ojo Verde Inn, and out of her billfold she carefully placed seven-hundred dollars on the counter, buying the painting outright. As time went on in her life, she never regretted the purchase and her children rotated the painting amongst themselves after she died…. The Pinon-Buttermilk Pancake woman gave an additional tip to her server at the Inn because she wanted to remember and enlarge the morning at brunch as a generous morning, a time punctuated with giving, and with art. An excerpt from the novel by Jack Matthews, The Red Aspens. Some of my current writing involves turquoise extracted from mines close to Taos, New Mexico. I purchased this 25 carat piece of turquoise that came from the King’s Manassa mine near Manassa, Colorado, that is just over the border from New Mexico north of Taos. The lapidary had begun to polish the turquoise and I bought it in this unfinished, but impressive, state. It was not expensive in its unrefined state. The provenance was documented by the jeweler at the lapidary in Taos. Notice the golden matrix (not gold, the color gold) and slightly greenish cast along with the cerulean blue. The Manassa mine is not worked anymore. 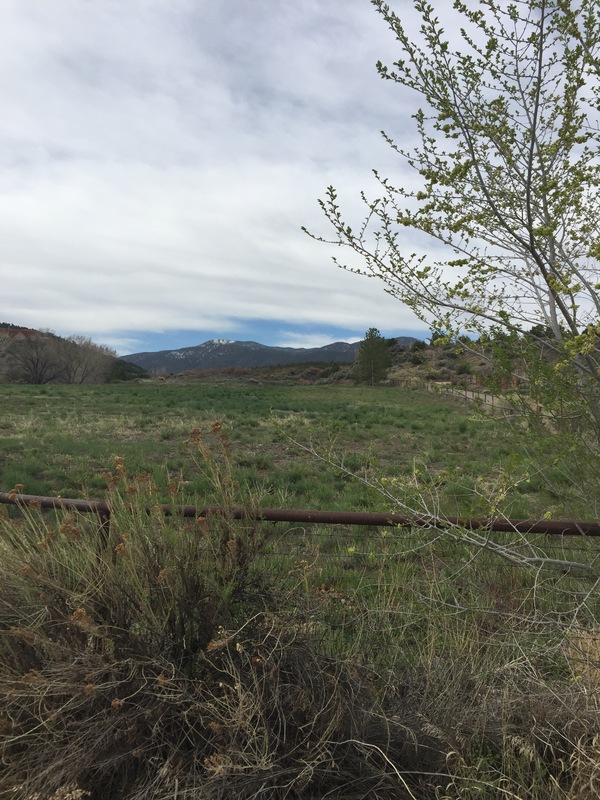 It was originally a mining site by Ancestral Pueblo peoples. L.P. King in 1890 found stone hammers and mallets about the site. King’s descendants still own the claim on private land. The purchase of this King’s Manassa turquoise is an object of inspiration for my writing, like an old photograph or piece of music that is played. I think you know what I am writing about, don’t you? When you write a letter or email to a close friend, do you not have a photograph to remind you of your connection? I have a close friend in Amarillo, Texas, who is in poor health, but when I write him, I have in front of me a group picture of us (with other friends) to remind me of when we were young and robust and had years (we hoped) in front of us. So it is with this blue-green turquoise with golden matrix that is placed to the left of my word processor when I write of northern New Mexico mining claims. The stone helps me start thinking. Below is a photograph from Joe Dan Lowry and Joe P. Lowry, Turquoise Unearthed: An Illustrated Guide, that shows King’s Manassa turquoise in jeweled splendor. Shalakos and Mudheads, Pop Chalee, Taos Pueblo, Ca. 1930. Exhibit at Millicent Rogers Museum, Taos, New Mexico. Photo by Jack Matthews. Pop Chalee’s Shalakos and Mudheads is a large painting, about eight feet in length. I saw this painting a few months ago. I’m not for sure it is still on exhibit. You need to email or call to find out if it is still displayed. I am currently in Taos and may go to the museum today. I retired from teaching in 2015 at Cisco College. I had been teaching college students since 1965, starting as graduate assistant at Texas A&M. Currently, I am conducting research and writing historical monographs relating to acequias and Old Spanish metrics of measurement in the 16th and 17th centuries as applied to explorations in New Mexico. I am also writing fiction and have an accumulation of finished short stories as well as some longer pieces. I spend a lot of time writing and conducting research in Fort Worth, Texas, and Taos, New Mexico. When I can I will post photographs and posts on Sage to Meadow. 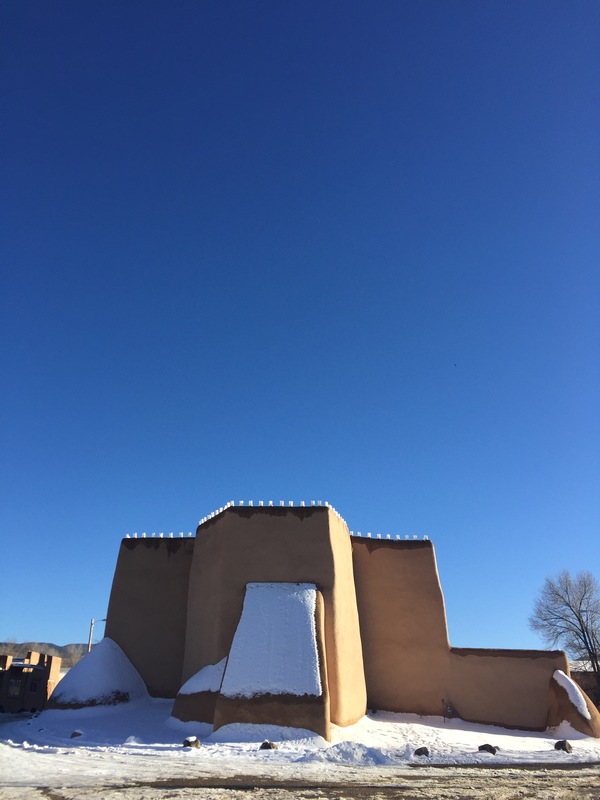 Several ceremonies are scheduled at Taos Pueblo over the next few weeks. Consult their website for more information. Light rain has fallen in the field. 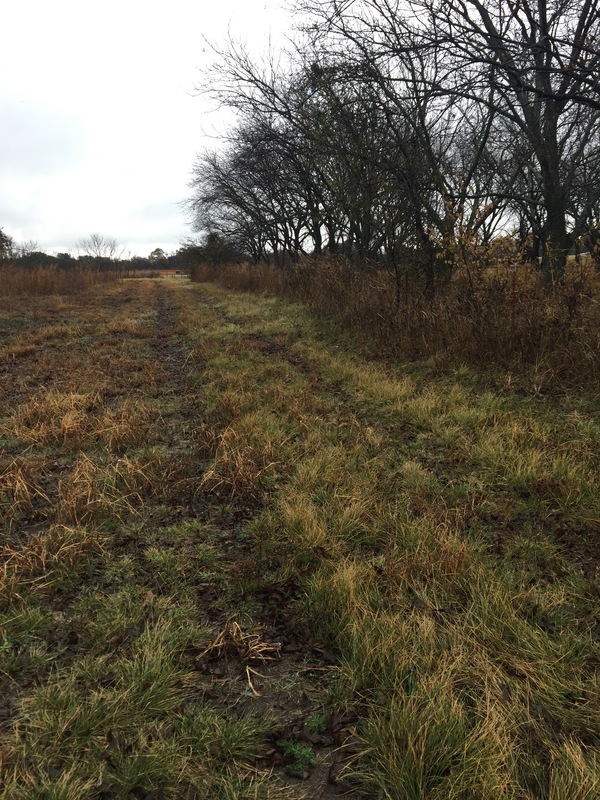 Late fall temperature is 53 degrees, the grass remains green, but most of the pasture has gone into dormancy. 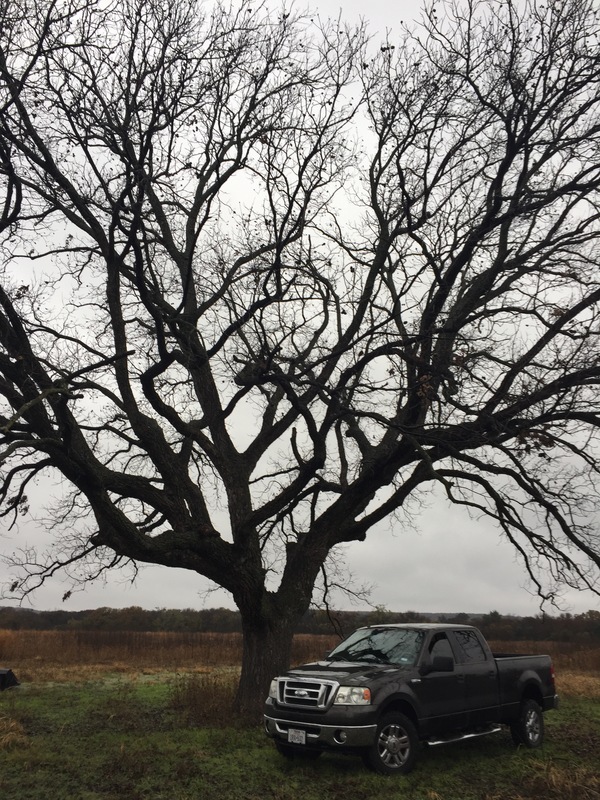 The pecan tree has shed leaves and pecans. I like the lane shown in the photograph above. Going east on the lane I leave the field, but coming towards me with the camera, I leave behind the traffic on the state highway and enter a different world of green lanes and a tractor that needs its engine turned over.